Patricia Briggs was born in 1965. Her joy in storytelling manifested itself early, and scaring her friends (including her husband Mike) was one of her funner hobbies. Patricia kept her story-telling abilities alive through college and her life in Chicago. When she and Mike moved to Montana she got the peace and quiet she needed to finally sit down and write, and she was able to publish Masques in 1993. Then Steal the Dragon followed as her next novel. After that one novel has followed the other. 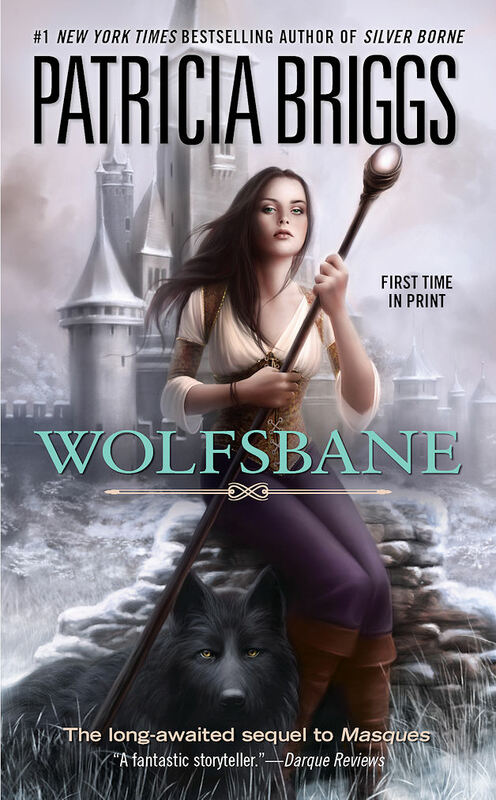 In the Sianim series Wolfsbane was the last one published thus far in 2010. For best effect, the books should be read in this order: Masques, Wolfsbane, Steal The Dragon, When Demons Walk. My version of Masques is the reworked one. Patricia Briggs writes a foreword warning the reader of this. Due to the years that had passed since the first edition of Masques, Briggs and her editor felt it appropriate to remove some of the traces of an author’s first attempt. The book is supposed to be full of clichés, but I’m lucky because I would not recognize a cliché if it bit me on the backside of forever. Geoffrey ae’Magi is gaining in power and followers. Ren, the spymaster of Sianim sends Aralorn off to see about a death-threat to the magician. At the time, Aralorn felt that switching places with one of the other slaves would be a good idea. With green magic as hers, she is able to change her physical appearance. But while at a party the Archmage is holding for various dignitaries, Aralorn changes her mind. She has been placed in a cage wearing the illusion of a snowfalcon form the ae’Magi has created. But one of the visitors seems to see through the illusion. The King of Reth comes up to Aralorn asking if she is in need of help. She says no. After the party the Archmage asks Aralorn a few questions. His magic is such that he can do the most horrendous things to people and still have them adore him. Aralorn is not sure how long she will be able to endure her stay with him. When she discovers that his plans for her include her demise, she decides to run. With her companion Wolf and her war-horse Sheen, Aralorn decides to find a way to fight the great and beloved Archmage’s evil magic. Wolfsbane is a tightly-coupled sequel to Masques, and won’t make much sense by itself. Masques had not been a hit and Steal the Dragon hadn’t done all that well either. 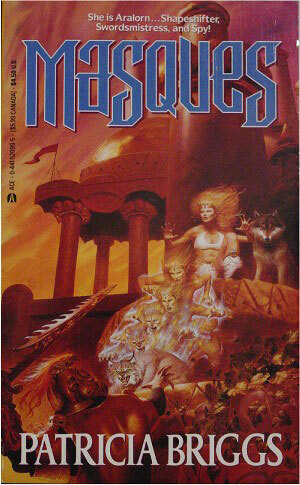 Briggs wrote Wolfsbane for her own enjoyment and left the book on her shelf. Eventually, she brushed the dust off it, and got it published. Wolf has been missing for a few weeks and Aralorn has been dreaming dreams of his childhood. Someone seems to be looking for him in them. Aralorn’s father has died, and Aralorn goes to attend his funeral. She has been gone from Lyon’s keep for ten years and finds it extra difficult that the circumstances are so sad. When she sees her father’s body, Aralorn discovers that Lyon is not quite dead. Instead, some kind of black magic seems to be involved. 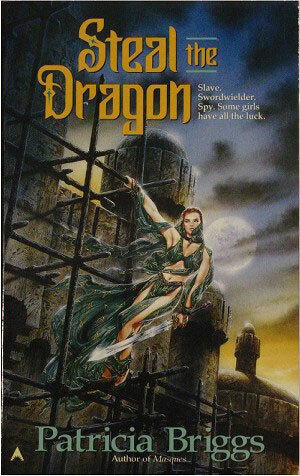 Steal the Dragon is the second book Patricia Briggs wrote. It wasn’t a great hit at the time, but did better than Masques. It has since become more popular. Steal the Dragon is set a little later than Wolfsbane. Geoffrey ae’Magi is already dead, but not for very long. In Sianam Ren, the spymaster, decides to send Rialla (former slave from Darran) and Laeth (brother to an important Lord in Darran) to Lord Karsten to try to prevent another murder attempt. Both are highly motivated to do so (Rialla after some convincing) for different reasons. When they get to Lord Karsten’s keep they play their roles as slave and master. When another attempt at Lord Karsten’s life occurs, they become worried for his safety. Then Rialla’s old master turns up at the keep and the two of them realize that they have probably stepped into a hornet’s nest. It turns out they are correct. When Demons Walk seems to be a while after the previous three installations in the Sianam series. 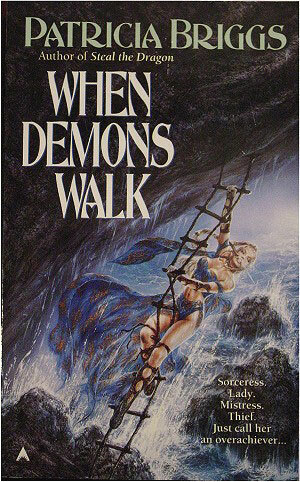 Like the others, When Demons Walk is light and entertaining reading. Patricia Briggs has her own style that is apparent in all of her novels. She is a good author, the quality of her writing is solid and her characters entertaining. Sham is an orphan from one of the take-overs of the Prophet of Altis. The Cybellians have taken over Southwood, and Sham is left to thieving. Her master (she is a magician/wizard) does not approve, but he does recognize that other venues might be more dangerous. Sham is surprised when she meets up with the Lord of Southwood – Lord Kerim. He is more likeable than she had thought, but still one of the enemy. But when attempts are made at various people’s lives (which include killing her master and trying to kill Lord Kerim), Sham put enmity aside and gives a helping hand in finding the culprit. Hmm. All four books in the Sianim series are interesting additions to Briggs’ archive. I liked them. Like I said, Briggs does solid work. Michael Enzweiller’s maps are a great addition to her website.